specialists and researchers in this very important arena. We will have stand A11 and will include the all new VUMAN E3+ videoscope, complete with remote focus and pneumatic articulation among the range of RVI and Thermal raging equipment on display and available for demonstration. Also on display will be the latest generation of the portable VUCAM Video endoscope, the Visio Probe system of 45mm Pan / Tilt cameras and the latest generation of micro Camera from MEDIGUS. Leading the Thermal Imaging range will be the latest T540 system fro m FLIR Systems – a high resolution system with articulating head and and a new user interface to make the system even easier to use. 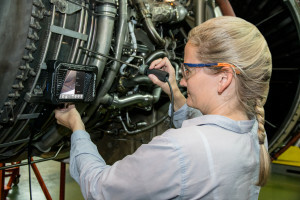 Compatible with both the standard FLIR Tools software suite and also the powerful ResearchIR Max software, this latest generation of Thermal imaging camera is ideal for both portable and laboratory based thermography. Please visit our stand to discuss your inspection or Thermography requirements – Stand A11, Materials Testing 2017, Telford International Exhibition centre, TF3 4JH. If you can’t join us but would like to know more please don’t hesitate to contact us.